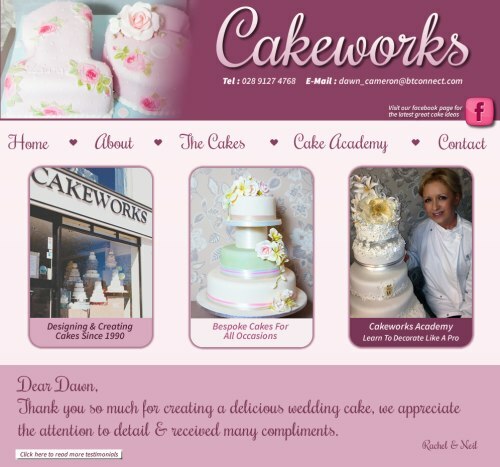 Cakeworks is a long established cake company based in Bangor founded over twenty years ago and designing & decorating wedding and celebration cakes ever since. The company have had a web presence with Ardnet for a long time so we were a natural choice to help them design their new website. We came up with a fun and funky design and uses animation, slideshows and lightbox galleries to display the cakes to their finest quality. Cakeworks have been commissioned to create cakes for many people including stars of stage and screen and even Her Majesty the Queen. Now they are also offering cake baking classes through their Cake Academy.